Saxophonist Paul “Hucklebuck” Williams was born in Kentucky in 1915, moving to Detroit as a teen where he began playing professionally while still in high school. After recording briefly with King Porter’s band he was offered his own contract with Savoy Records in 1947 and proceeded to make history… more than once. Though the saxophone was a notable part of jazz it was another field that Williams headed into right away, cutting the first rock instrumentals that fall, scoring a regional hit with his debut, then notching the first national hit with its follow-up. That opened up the gates through which a parade of sax players stepped out from the shadows of playing anonymously behind others and enabled them to become stars in their own right in rock ‘n’ roll by featuring often crude raunchy solos highlighted by their guttural honks and ear-piercing squeals, all designed to get listeners on their feet and grinding away without inhibition. Though usually more restrained than many of his competitors as this style took hold Williams reaped the rewards with a string of hits, capped by the biggest instrumental #1 R&B hit in history, “The Hucklebuck”, which gained him the nickname for which he’d forever be known. 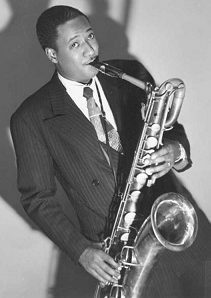 Unlike others who primarily played tenor, Williams used mostly a baritone and occasionally alto sax, giving his records a slightly different feel, though he frequently paired with tenor Wild Bill Moore in his early days while he played on Moore’s featured releases as well. When the sax instrumental hit-making potential started to recede in the 50’s Williams found steady work by leading the bands enlisted to back multi-artist rock ‘n’ roll package tours. In fact his was the only act that actually got to play at the legendary Moondog Coronation Ball in Cleveland in March 1952, the show hosted by radio dee-jay Alan Freed which ended in a riot and spread the reputation of rock as a dangerous music across the land. Williams settled in at the Apollo Theater by mid-decade, leading the house band and could still be found chipping in on various sessions into the 60’s before he retired from playing and opened a booking agency. Williams died in 2002 at 87 years old, one of the few men left into the 21st Century who was both a participant and first-hand witness rock’s evolution from the very beginning. As sideman… for Wild Bill Moore. As sideman… behind Wild Bill Moore.